WACO, TX — Baylor (17-24) returned to the win column with a pair of wins over Lamar, 6-0 and 2-0, Tuesday night at Getterman Stadium. The Lady Bears did so in shutout fashion as they recorded back-to-back shutouts for the first time this season. Goose McGlaun pitched her first career shutout as the junior gave up only four hits through seven innings of work. The Baylor defense backed her up with zero errors in the game. The Lady Bears turned a double play in the top of the fourth when Nicky Dawson fielded a sharply hit grounder, threw to Taylor Ellis at second who fired a throw to Goose McGlaun at first. Offensively, Baylor finished with six hits on the night. Lou Gilbert and Ana Watson each finished 2-for-2 at the plate with a walk. Gilbert also scored two runs. Baylor took an early lead with three runs in the first inning. Dawson got things started with a walk, and Gilbert followed with a walk of her own to put two runners on base with no outs. Kassidy Krupit then laid down a bunt in front of home plate and reached first base safely off a throwing error by the Lamar catcher. That err allowed Dawson and Gilbert to score. Krupit later came home when Taylor Ellis singled to left field after battling through an eight pitch at-bat. The Lady Bears added to their lead the next inning as Baylor had runners on first and second with one out when Gilbert stepped to the plate. 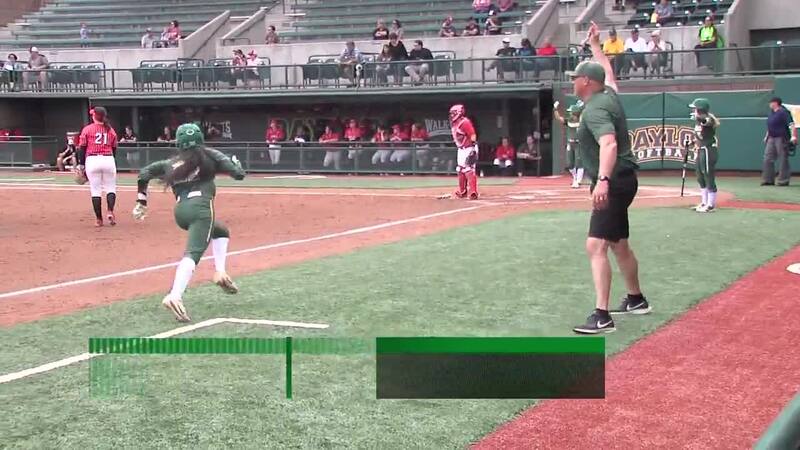 Gilbert reached first safely when the Lamar third baseman overthrew first which plated a pair of runs for Baylor. Gilbert scored shortly after when Goose McGlaun hit a sacrifice fly to left field. The heart of Baylor’s lineup went to work in the second inning to give the Lady Bears a lead they wouldn’t give up in the second game of Tuesday’s doubleheader. Goose McGlaun led off the inning with a single to second base and then advanced to second when Taylor Ellis singled to deep center field. Both of them scored when Josie Bower launched a two-out double to left field. It was Bower’s fourth career double. Defensively, Baylor worked through three different pitchers. Kassidy Krupit got the start as she gave up one hit through three innings of work. Next up was Regan Green who returned to the field after being out the last five weeks due to injury. Green gave up two hits with a strikeout through two innings of work. Sidney Holman then came in to shut things down in the final two innings. Goose McGlaun recorded her first career shutout in the first game against Lamar. Lou Gilbert recorded her sixth career multi-hit game. Ana Watson recorded her seventh career multi-hit game. Baylor turned its 13th double play in the first game against Lamar. Regan Green and Hannah Thompson each returned to action for the first time in five weeks. Nicky Dawson set a new career high with six assists in each game against Lamar on Tuesday. Her previous career high was five that she reached three times. 0 – Number of runs Baylor allowed on the day. Baylor hosts Iowa State Thursday - Saturday.